Your first visit with the team at Anastasia Dental Associates will be an important one. To make sure that you receive a proper introduction, a thorough examination, and an informative consultation, we will reserve a specific appointment time just for you. Upon your arrival, we will ask that you complete a series of health history and insurance forms, as well as our office policies and patient privacy forms. These documents will also help to get you acquainted with our office. You may need to arrive 10-15 minutes prior to your scheduled appointment time in order to complete these documents, or you may print and complete your new patient forms online via our website. Please bring any completed forms to your first appointment. You should allow approximately one hour for your initial examination. During this time, our experienced team will chart and document your existing dental conditions, discuss your main concerns, and provide oral hygiene instructions. It may also be possible for you to have your teeth cleaned during this initial visit. Your appointment will be concluded with a detailed discussion regarding the current state of your dental health and all of the recommended treatments will be explained. 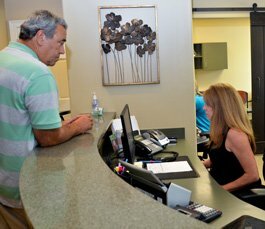 As a courtesy, to aid you in receiving your full insurance benefits, our knowledgeable business team will be happy to submit the insurance claims for the treatment that you receive in our office. However, we must remind you that you are personally responsible for any fees that your insurance fails to pay on your behalf. Beyond your insurance coverage, our business team will fully disclose all treatment fees and payment options in advance in order to accommodate your financial circumstances. If you have additional concerns or requests for any special arrangements, please notify our office manager in advance. We are excited about the opportunity to provide exemplary oral healthcare for you and your family! If you haven’t already done so, please call to schedule your first visit today.